Blue Origin said Sunday that a set of powerpack hardware for the company’s BE-4 engine was lost as the result of a ground testing mishap, though no further information on any impacts on the planned BE-4 development program were clear at that point. 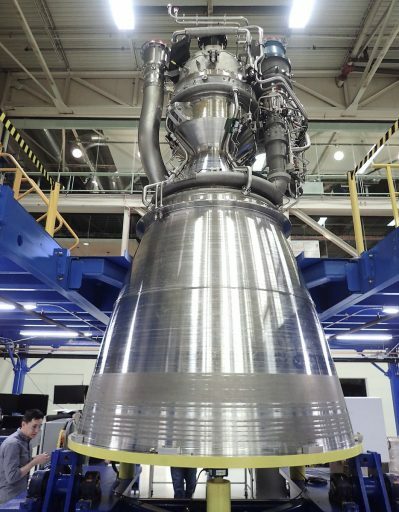 BE-4 is being developed as a powerful all-U.S.-built propulsion system for use by Blue Origin’s upcoming New Glenn launch vehicle and also listed as the leading engine candidate for United Launch Alliance’s future Vulcan rocket. The company, founded by Amazon’s Jeff Bezos, announced the mishap through Twitter on Sunday: “We lost a set of powerpack test hardware on one of our BE-4 test stands yesterday. 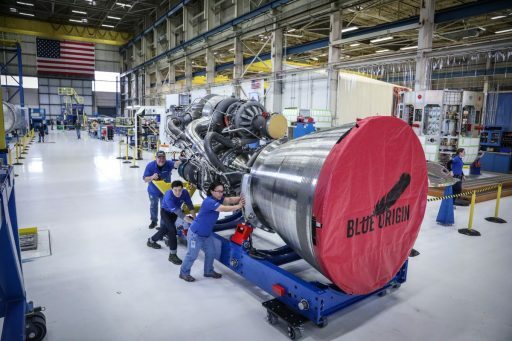 Not unusual during development.” No further details on the nature of the test and how the mishap occurred were disclosed by the Kent-based company, though Blue Origin did say that the mishap occurred on one of two test stand at their Van Horn, Texas facility. The two test stands at the West Texas facility are suitable for powerpack testing at reduced and full power levels as well as full-scale BE-4 firings. 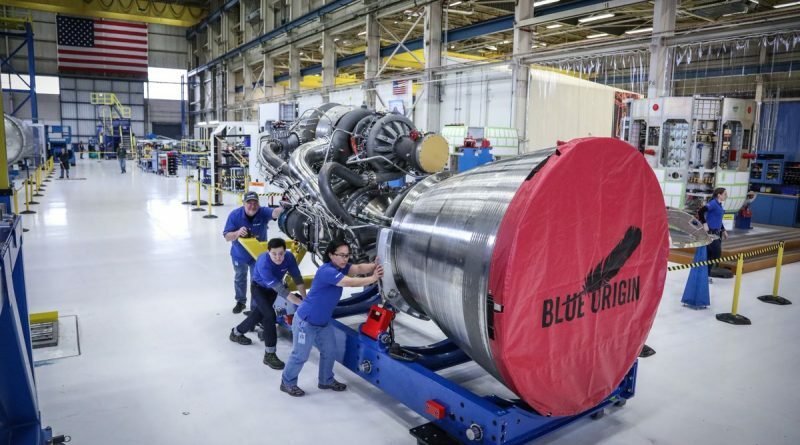 Blue Origin hinted several weeks ago a full-scale firing of a BE-4 engine was coming soon. Back in March, the company presented their first fully integrated BE-4 engine at the Kent manufacturing base before shipping out to the test site with production engines #2 and #3 expected to follow in close succession. The wording of Blue Origin’s Tweets is rather vague, not providing a characterization of the severity of the mishap which could range between a full-on explosion of the high-pressure section of the powerpack to a more benign event like an emergency cutoff that resulted in the powerpack being damaged beyond repair. It is also not clear whether the test stand incurred damage. The powerpack of a rocket engine includes everything upstream of the combustion chamber and main injector – turbopumps, valves and lines that provide the fuel/oxidizer mix to the injector. Powerpack testing is a logical step in rocket engine development that comes after individual components like gas generator, turbines and injectors are tested and before a full engine complete with combustion chamber & nozzle is put to the test. 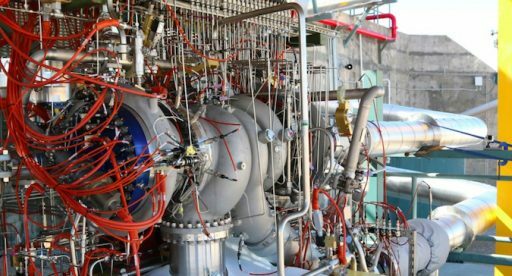 BE-4 is by far the largest methane-fueled engine ever built, coming with the risk of unknown territory which is one of the deciding factors in ULA keeping a backup engine option available for its new rocket until late in its design program. Per Blue Origin’s schedule, BE-4 is planned to be certified to go into full production by the end of this year with ULA’s Vulcan targeting its initial launch no earlier than 2019 and New Glenn looking at a debut mission in 2020. United Launch Alliance President and CEO Tory Bruno recently commented that Blue Origin was ahead of Aerojet Rocketdyne in the development of a new U.S. rocket engine that will be the replacement for the RD-180 powerplants imported from Russia to power Atlas V’s first stage. Given its country of origin, RD-180 has been the central point of much discussion in recent years with an agreement between ULA and the U.S. government to end reliance on Russian propulsion technology for national security missions as soon as possible. Although ULA said Blue Origin was the leading candidate for Vulcan, the company is still keeping an option to switch to Aerojet Rocketdyne’s AR-1 – a 2,200-Kilonewton class engine using the ‘safe’ Rocket Propellant-1 / Liquid Oxygen combination that is well understood after decades of use in rocketry. AR-1 is looking at certification by 2019 with flight readiness achieved by 2020. ULA’s Vulcan rocket will be powered by a pair of main engines on its first stage plus up to six GEM-63XL Solid Rocket Boosters that will be used to size the rocket to each payload’s specific requirements while the flight-proven Centaur upper stage provides the final injection of payloads before ULA’s Advanced Cryogenic Evolved Stage (ACES) takes on the role of the upper stage in the second half of the 2020s. 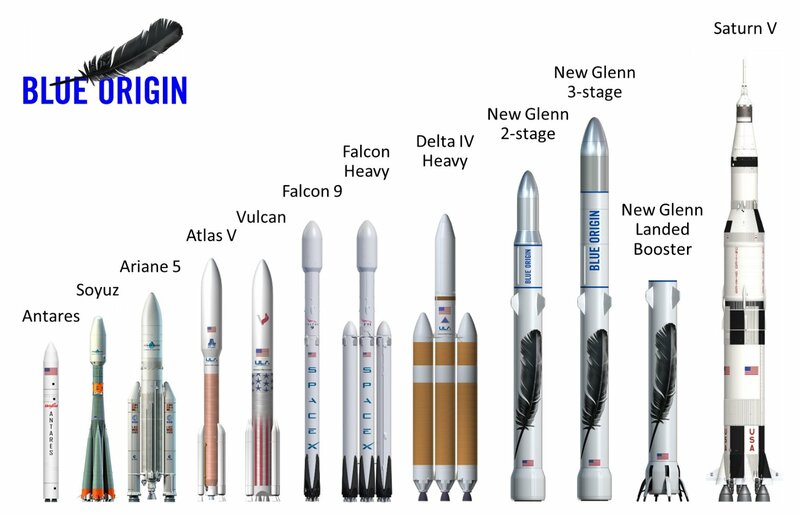 New Glenn will employ seven BE-4 engines on its first stage, giving it a thrust of 17.1 Meganewtons – about half that of the mighty Saturn V. The rocket’s second stage will be powered by a vacuum-optimized version of the BE-4 sporting an extended nozzle. 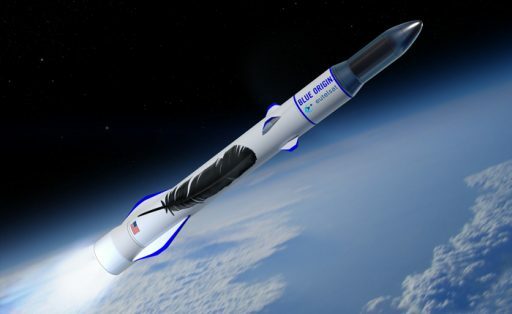 The 82-meter tall two-stage vehicle will be used for heavy-lift missions to Low Earth Orbit while high-energy deliveries to GTO and Beyond Earth Orbit would be handled by a 95-meter tall version sporting a cryogenic third stage powered by a version of Blue’s BE-3 that is already flying on the New Shepard sub-orbital vehicle. According to Bezos’ remarks, New Glenn will be able to carry 45 metric tons into Low Earth Orbit and 13 metric tons to Geostationary Transfer Orbit.